Today I would like to use the letter U as an opportunity to write about my uncles. On my father’s side I had three uncles – Ron and Jack were my Dad’s brothers and Bert was their sister Nancy’s husband. 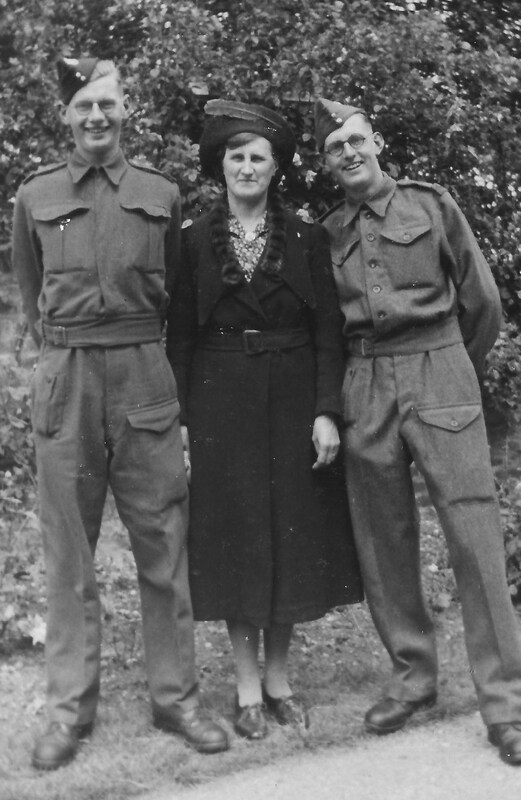 In the photographs above Ron is standing on the right, Gordon my father is standing on the left and their mother, Annie is in the middle. In the other photograph, left to right are Jack, Enid (my mother), Gordon and Ron. I saw more of my Uncle Jack when I was growing up because he always lived with my grandmother so he was there when I went to visit her. Uncle Ron had married and moved away, so we didn’t see so much of him then. Nancy and Bert lived in the same town, and I would see them a few times a year when we exchanged birthday and Christmas presents. On my mother’s side I’m really not sure how many uncles I have, it’s all more muddled. Her birth mother had no more children, but her adoptive family included several brothers and sisters. I’m really unsure who these all were, I can’t even begin to name them. I think this must have been because they were all older than my mother, and had left home by the time I came along. I remember an Uncle Fred, who came back into my mother’s life in later years. He would come with his wife Dorothy and little dog, Tiny to stay with us for holidays and we would go out for days with them. We also went to stay with them for a week in Wales at one time. I really can’t remember or unravel who the rest of this family were, I really should make more effort to get to know them and trace that part of my family. This entry was posted in A - Z Blogging Challenge 2013, Enid May Howells, Gordon Charles Dinnis, Jack Douglas Dinnis, Ronald Stanley Dinnis and tagged Brighton, Family History. Bookmark the permalink.